Built to serve as an all-purpose gun in the field, Steyr Arms’ Mannlicher Scout is a lightweight, compact powerhouse that now features new camo finishes. 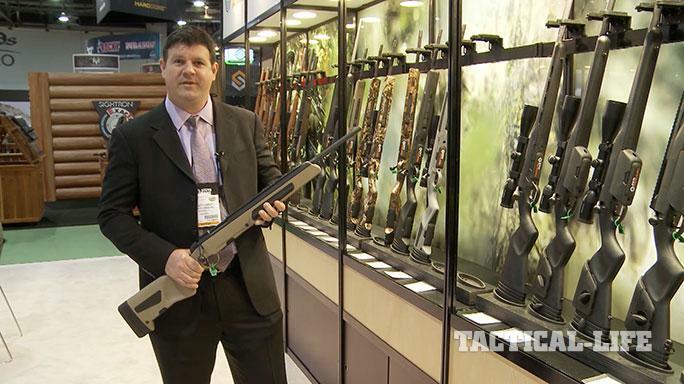 Steyr Arms continues to update its Mannlicher Scout series of rifles for 2015. By adding a number of new finish options, Steyr gives shooters a choice between the traditional grey coloring as well as new camouflage versions for sporting use. The Mannlicher Scout is available in .223 Rem, .243 Rem, 7mm-08 Rem and .308 Win chamberings. Unique to Steyr’s Mannlicher Scout is its integrated folding bipod that folds out from the rifle’s forend. Another unique feature is the rifle’s ability to hold a spare five-round magazine in a hollow well located in the bottom of the stock. The rifle ships with two five-round magazines, but 10-round magazine are also available. The compact Scout rifle concept was originally defined by the legendary Jeff Cooper in the 1980s, with Cooper detailing what he believed would make for the best all-purpose rifle. Built as a kind of one-gun solution to a variety of tasks in the field, the synthetic-stocked Mannlicher Scout weighs only 6.6 pounds. 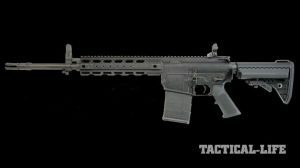 With a 19-inch barrel and an overall length of only 38.6 inches, the rifle retains relatively compact dimensions while offering longer-distance shooting. A Weaver scope-mounting rail allows for the attachment of an optic. For more information on the Mannlicher Scout, visit steyrarms.com or call 205-417-8644.